Who wouldn't want roses on Valentine's Day? It's safe to say everyone would love to receive these special flowers that represent love. This Valentine’s Day card features red roses and a message of love that will melt your loved one's heart. Send these fabulous red roses out right away while they are still so perfect. 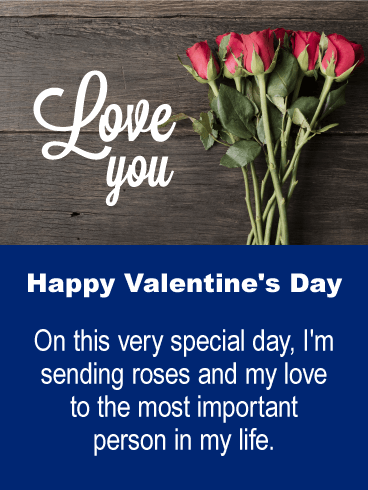 Happy Valentine's Day - On this very special day, I'm sending roses and my love to the most important person in my life. If you are looking for a great Valentine's Day card to send to the one you love, this is it! When this handsome puppy says, "I Love You", he means it, and he wants to send this message to your special someone! It is designed with shades of black, gray, and dark red to give a striking appearance. 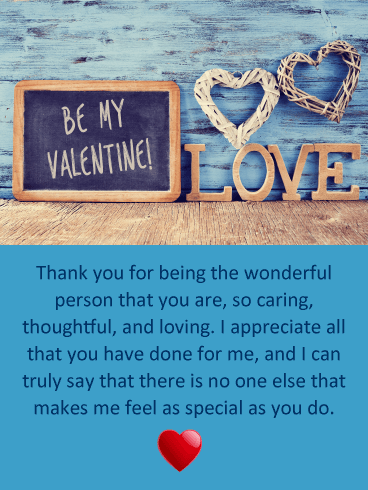 This Valentine's Day card will tell your Valentine that you are thankful to have him or her in your life! This fun Valentine's Day card will let the one you care about know you feel the two of you make a great pair, and that you love them! The creative image of the pairs of shoes and Happy Valentine's Day text make for a clever, cute, and interesting photo. This Valentine's Day card will certainly get the message across! 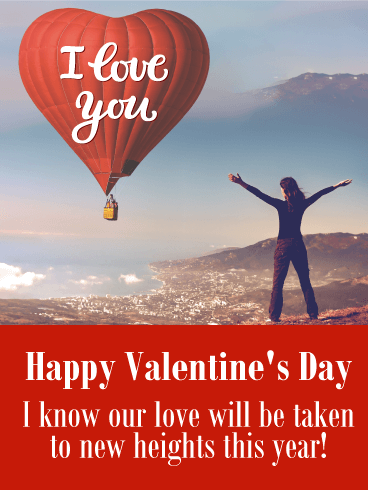 Send this terrific Valentine's Day card out to him or her today! 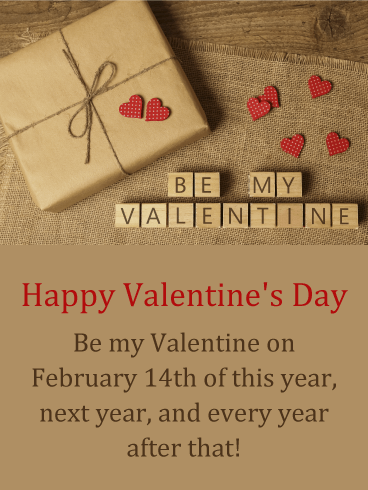 Would you like to let the person you care about know you want him or her to be your Valentine this February 14th and every year after? Then send this Valentine's Day card today! It will spell it out for them! With colors red and tan, it will certainly appeal to both a man and a woman. 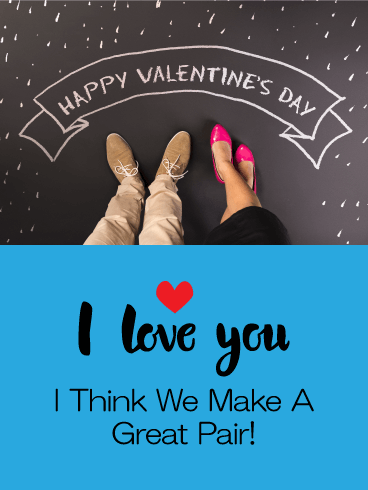 Whether it be your spouse or the person you are dating, they are going to love it! Thank the one you love on Valentine's Day for being such a wonderful person with this special Valentine's Day card. The image features meaningful words such as, "Be My Valentine" and "Love". Your special someone will certainly get the message! This Valentine's Day card will also tell them that no one makes you feel as special as they do. It will warm their heart and make them love you even more this Valentine's Day. 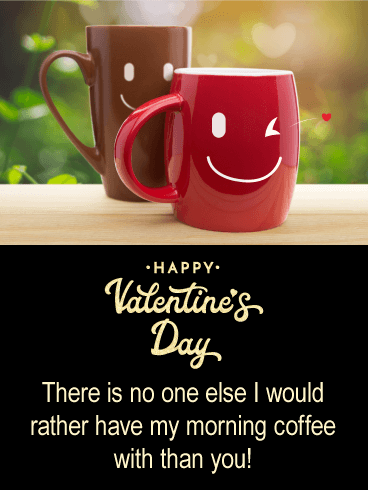 On this Valentine's Day, let the love of your life know that there is no one else that you would rather start the day with over morning coffee then him or her. It will put a smile on their face. The coffee mugs are smiling and one is winking, it will certainly get a little laugh. With tones of brown, green, black and red, this Valentine's Day card would be appropriate for both men and women! 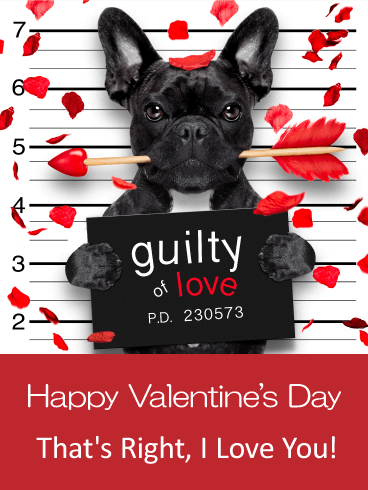 You are guilty of love and not afraid to tell your Valentine! 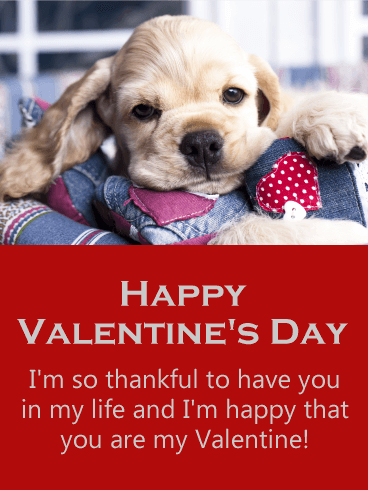 This Happy Valentine's Day card will let the person you care about know how much you love them, and they will also get a little laugh after seeing this dog holding a sign that professes your love! It features colors of black, white, and red, which is perfect for sending to a man or woman! Send this Valentine's Day card without delay. 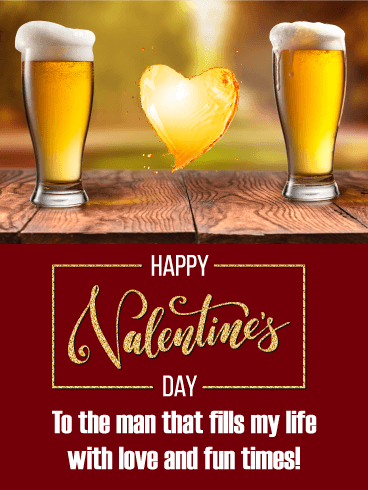 If you and your special guy are lovers of fine beer and good times, then he is going to love this Valentine's Day card. Don't be surprised if he even shows it to his friends to let them know how cool you are that you sent him a beer related Valentine’s Day card! It feature's an image of two perfect beers with an amber colored heart between the two. He will think it's the best! 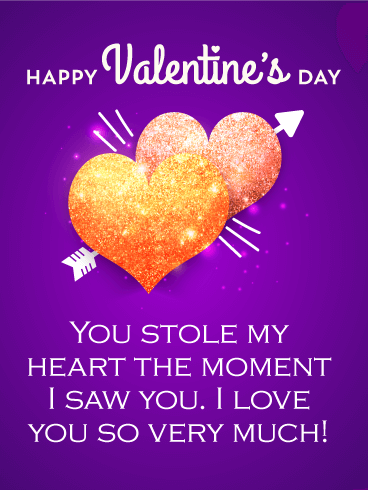 Did your loved one steal your heart the moment you saw him or her? If they did, you should let them know with this meaningful Valentine's Day card. It features two sparkling hearts that are connected by an arrow of love. 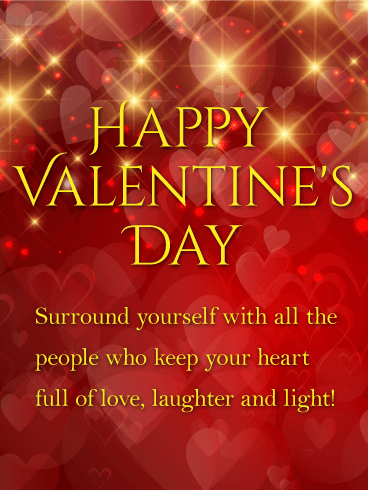 This February 14th is the day to express your love, so send this great Valentine's Day greeting card out sealed with your love. Your special someone will appreciate it! You're in love and it's only going to get better! 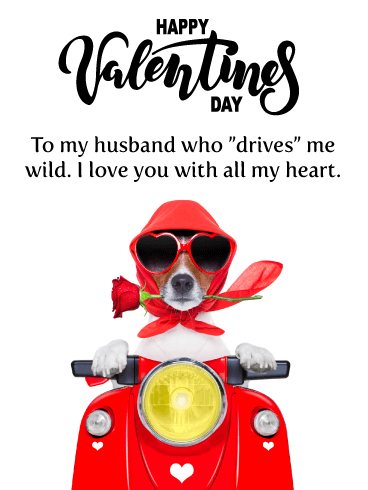 Let the man in your life know that your love together will be taken to new heights by sending this Valentine's Day card his way. He will be very excited to know that you are thinking about the future and what it holds for the two of you! The red heart balloon floating high in the sky represents your love, and the sky is the limit! 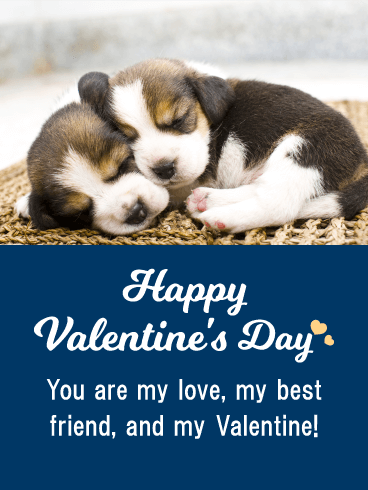 Everyone loves puppies and they look so perfect on this Valentine's Day card as they snuggle while sleeping. So cute! With colors of brown, white, and blue, this Valentine's Day card can be sent to a man or woman. The message expresses that you feel your loved one is also your best friend. It doesn't get any more touching than this. Send these little puppies on their way to share their love this Valentine's Day!